Athletes need to perform their best, and that starts with proper hydration. Thermos® vacuum insulation technology delivers maximum temperature retention every time so that your drink stays cold the entire time you're training or competing. 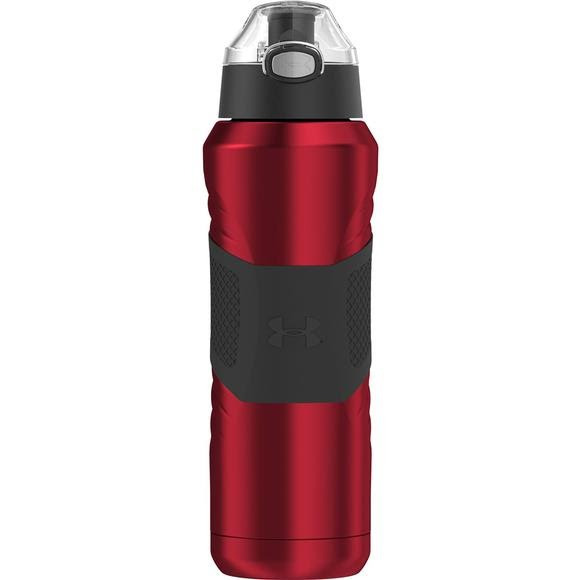 The Under Armour® 24-ounce vacuum insulated hydration bottle will keep cold for up to 20 hours and features durable double wall stainless steel construction. Athletes need to perform their best, and that starts with proper hydration. Thermos® vacuum insulation technology delivers maximum temperature retention every time so that your drink stays cold the entire time you&apos;re training or competing. The Under Armour® 24-ounce vacuum insulated hydration bottle will keep cold for up to 20 hours and features durable double wall stainless steel construction. The push button lid is easy to operate with one hand and includes a locking ring to keep the lid secure during transport. The soft touch silicone grip is comfortable to hold.